The left photograph shows an untreated 21-month-old girl with congenital hypopituitarism. 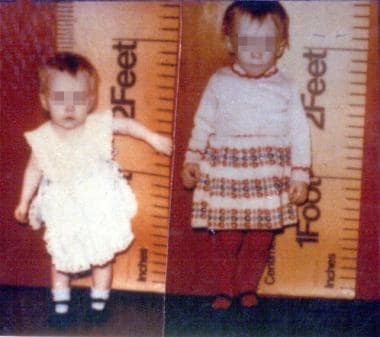 The right panel depicts the same child aged 29 months, following 8 months of growth hormone therapy. Regulation of the development of the mammalian anterior pituitary gland by transcription factors. Following, inductive signals between the developing diencephalon and the oral ectoderm, early transcription factors guide the formation of rudimentary Rathke's Pouch (rRP) and then subsequent gene regulatory pathways control the determination, proliferation, and differentiation events that establish the specialized hormone-secreting cells. AP = anterior pituitary, IP = intermediate pituitary, PP = posterior pituitary. Modified by S. Rhodes from Mullen, R.D., Colvin, S.C., Hunter, C.H., Savage, J.J., Walvoord, E.C., Bhangoo, A.P.S., Ten, T., Weigel, J., Pfäffle, R.W., and Rhodes, S.J. (2007). Roles of the LHX3 and LHX4 LIM-homeodomain factors in pituitary development. Mol. Cell. Endocrinol., 265-266: 190-195. PRL secretion is distinct from that of the other anterior pituitary hormones, being inhibited by hypothalamic dopamine. In addition, antidiuretic hormone (ADH) produced in the hypothalamus acts synergistically with CRH to promote ACTH release. A negative feedback loop occurs such that the hormones produced in the target glands feed back to inhibit the release of their respective regulatory pituitary and hypothalamic factors. For example, hypothalamic TRH stimulates TSH release, which in turn stimulates the thyroid gland, resulting in increased serum levels of thyroxine (T4) and triiodothyronine (T3). When they have reached sufficient levels, T3 and T4 suppress TRH and TSH release. The posterior pituitary consists of neural tissue that descends from the floor of the third ventricle. In contrast to the anterior pituitary hormones, the posterior pituitary hormones (ie, ADH, oxytocin) are synthesized by cell bodies in the hypothalamus and transported along the neurohypophyseal tract of the pituitary stalk. Release of these hormones occurs in response to neurohypophyseal stimuli. Hypopituitarism has multiple possible etiologies either from congenital or acquired mechanisms. The common endpoint is disrupted synthesis or release of 1 or more pituitary hormones, resulting in clinical manifestations of hypopituitarism. Mutations in pituitary transcription factors can cause multiple pituitary hormone deficiencies (MPHD) or, less commonly, an isolated pituitary hormone deficiency. Mutations in PIT1 (POUF1)  and PROP1 [3, 4] (ie, prophet of Pit-1) were the first mutations shown to cause MPHD. Mutations in the PIT1 gene produce a phenotype consisting of deficiencies of GH, PRL, and TSH. Mutations in genes LHX3 and LHX4, which are expressed prior to Pit-1 and PROP1, have also been described as causing a phenotype of MPHD. Homozygous inactivating mutations in HESX1 produce a complex phenotype with pituitary hypoplasia that resembles septo-optic dysplasia (SOD). Most cases of SOD remain sporadic without a known genetic defect, and much remains to be learned about the role of HESX1 in other forms of hypopituitarism. Mutations in the GH gene or the GHRH gene lead to isolated GH deficiency (GHD). Mutations in the genes KAL and KISS1R lead to isolated gonadotropin deficiency. KAL plays a causative role in some forms of Kallmann syndrome. Causes of hypopituitarism can be divided into categories of congenital and acquired causes. An overview of causes based on categories is summarized below. Because hypopituitarism has congenital and acquired forms, the disease can occur in neonates, infants, children, adolescents, and adults. With appropriate treatment, the overall prognosis in hypopituitarism is very good. Sequelae from episodes of severe hypoglycemia, hypernatremia, or adrenal crises are among potential complications. Long-term complications include short stature, osteoporosis, increased cardiovascular morbidity/mortality, and infertility. Previous findings of increased cardiovascular morbidity and decreased life expectancy in adults with hypopituitarism were thought to be largely secondary to untreated GHD. Morbidity and mortality statistics generally cannot be viewed in isolation but must instead be related to the underlying cause of hypopituitarism. For example, morbidity and mortality are minimal in the context of idiopathic GHD compared with hypopituitarism caused by craniopharyngioma. Hypoglycemia - Can cause convulsions; persistent, severe hypoglycemia can cause permanent CNS injury. Adrenal crisis - Can occur during periods of significant stress, from ACTH or CRH deficiency; symptoms include profound hypotension, severe shock, and death. Short stature - Can have significant psychosocial consequences. GHD is believed to be an important contributing factor to morbidity and mortality associated with hypopituitarism. In a 2008 study, childhood onset GHD was associated with an increased hazard ratio for morbidity of greater than 3.0 for males and females. Causes of morbidity and mortality are multifactorial and relate to the specific cause of hypopituitarism, as well as to the degree of pituitary hormone deficiency. Teaching patients when and how to administer appropriate stress doses (oral and parenteral) of hydrocortisone is essential. When treatment includes recombinant human growth hormone (rhGH) therapy, instruct parents and patients to recognize and report adverse effects. Express the importance of wearing a medical identification bracelet or necklace. Genetic counseling with parents and patients about the mode of transmission of hypopituitarism is important for cases involving heritable forms of the disease. Mehta A, Hindmarsh PC, Mehta H, Turton JP, Russell-Eggitt I, Taylor D, et al. Congenital hypopituitarism: clinical, molecular and neuroradiological correlates. Clin Endocrinol (Oxf). 2009 Mar 6. [Medline]. Parks JS, Kinoshita EI, Pfaffle RW. Pit-1 and hypopituitarism. Trends Endocrinol Metab. 1993. 4:81-5. Rosenbloom AL, Almonte AS, Brown MR, et al. Clinical and biochemical phenotype of familial anterior hypopituitarism from mutation of the PROP1 gene. J Clin Endocrinol Metab. 1999 Jan. 84(1):50-7. [Medline]. [Full Text]. Lebl J, Vosahlo J, Pfaeffle RW, et al. Auxological and endocrine phenotype in a population-based cohort of patients with PROP1 gene defects. Eur J Endocrinol. 2005 Sep. 153(3):389-96. [Medline]. Bottner A, Keller E, Kratzsch J, et al. PROP1 mutations cause progressive deterioration of anterior pituitary function including adrenal insufficiency: a longitudinal analysis. J Clin Endocrinol Metab. 2004 Oct. 89(10):5256-65. [Medline]. [Full Text]. Fluck C, Deladoey J, Rutishauser K, et al. Phenotypic variability in familial combined pituitary hormone deficiency caused by a PROP1 gene mutation resulting in the substitution of Arg-->Cys at codon 120 (R120C). J Clin Endocrinol Metab. 1998 Oct. 83(10):3727-34. [Medline]. [Full Text]. Mullen, R.D., Colvin, S.C., Hunter, C.H., et al. Roles of the LHX3 and LHX4 LIM-homeodomain factors in pituitary development. Mol. Cell. Endocrinol. 2007. 265:190-195. Kim SS, Kim Y, Shin YL, et al. Clinical characteristics and molecular analysis of PIT1, PROP1, LHX3, and HESX1 in combined pituitary hormone deficiency patients with abnormal pituitary MR imaging. Horm Res. 2003. 60(6):277-83. [Medline]. Pinto G, Netchine I, Sobrier ML, et al. Pituitary stalk interruption syndrome: a clinical-biological-genetic assessment of its pathogenesis. J Clin Endocrinol Metab. 1997 Oct. 82(10):3450-4. [Medline]. [Full Text]. Darzy KH, Shalet SM. Hypopituitarism following Radiotherapy. Wallace WHB, Kelnar CJH. Endocrinopathy after Childhood Cancer Treatment. Basel: Karger; 2009. 15: 1-24. Ghigo E, Masel B, Aimaretti G, et al. Consensus guidelines on screening for hypopituitarism following traumatic brain injury. Brain Inj. 2005 Aug 20. 19(9):711-24. [Medline]. Acerini CL, Tasker RC. Endocrine Sequelae of Traumatic Brain Injury in Childhood. Horm Res. 2007. 68(suppl 5):14-17. Sklar CA. Craniopharyngioma: endocrine abnormalities at presentation. Pediatr Neurosurg. 1994. 21 Suppl 1:18-20. [Medline]. Mootha SL, Barkovich AJ, Grumbach MM, et al. Idiopathic hypothalamic diabetes insipidus, pituitary stalk thickening, and the occult intracranial germinoma in children and adolescents. J Clin Endocrinol Metab. 1997 May. 82(5):1362-7. [Medline]. [Full Text]. Lindsay R, Feldkamp M, Harris D, et al. Utah Growth Study: growth standards and the prevalence of growth hormone deficiency. J Pediatr. 1994 Jul. 125(1):29-35. [Medline]. Regal M, Parmo C, Sierra SM, Garcia-Mayor RV. Prevaence and Incidence of Hypopituitarism in an Adult Caucasian Population in Northwestern Spain. Clin Endocrinol. 2001. 55:735-740. Stochholm K, Laursen T, Green A, Laurberg P, Andersen M, Kristensen LØ, et al. Morbidity and GH deficiency: a nationwide study. Eur J Endocrinol. 2008 Apr. 158(4):447-57. [Medline]. White SM, Campbell DJ. Primary hypopituitarism and peri-operative steroid supplementation. Anaesthesia. 2009 Mar. 64(3):336-7. [Medline]. Choo-Kang LR, Sun CC, Counts DR. Cholestasis and hypoglycemia: manifestations of congenital anterior hypopituitarism. J Clin Endocrinol Metab. 1996 Aug. 81(8):2786-9. [Medline]. Sane K, Pescovitz OH. The clitoral index: a determination of clitoral size in normal girls and in girls with abnormal sexual development. J Pediatr. 1992 Feb. 120(2 Pt 1):264-6. [Medline]. Garcia-Filion P, Epport K, Nelson M, Azen C, et al. Neuroradiographic, Endocrinologic, and Ophthalmic Correlates of Adverse Developmental Outcomes in Children With Optic Nerve Hypoplasia: A Prospective Study. Pediatrics. 2008. 121:e653-e659. Borchert M, Garcia-Filion P. The Syndrome of Optic Nerve Hypoplasia. Current Neurology and Neuroscience Reports. 2008. 8:395 - 403. Argyropoulou MI, Kiortsis DN. MRI of the hypothalamic-pituitary axis in children. Pediatr Radiol. 2005 Nov. 35(11):1045-55. [Medline]. Rosenfeld RG. Disorders of growth hormone and insulin-like growth factor secretion and action. Pediatric Endocrinology. 1996. 117-169. Weinzimer SA, Homan SA, Ferry RJ, Moshang T. Serum IGF-I and IGFBP-3 concentrations do not accurately predict growth hormone deficiency in children with brain tumours. Clin Endocrinol. 1999. 51(3):339-45. Jostel A, Ryder WD, Shalet SM. The use of thyroid function tests in the diagnosis of hypopituitarism: definition and evaluation of the TSH Index. Clin Endocrinol (Oxf). 2009 Feb 18. [Medline]. Toogood AA, Stewart PM. Hypopituitarism: Clinical Featues, Diagnosis, and Management. Barkan AL. Endocrinology and Metabolism Clinics of North America. 1. Philadelphia: Elsevier Saunders; 2008. 37: 235-261. Reifschneider K, Auble BA, Rose SR. Update of Endocrine Dysfunction following Pediatric Traumatic Brain Injury. J Clin Med. 2015 Jul 31. 4 (8):1536-60. [Medline]. Crowne E, Gleeson H, Benghiat H, Sanghera P, Toogood A. Effect of cancer treatment on hypothalamic-pituitary function. Lancet Diabetes Endocrinol. 2015 Jul. 3 (7):568-76. [Medline]. Kurtoğlu S, Özdemir A, Hatipoğlu N. Neonatal Hypopituitarism: Diagnosis and Treatment Approaches. J Clin Res Pediatr Endocrinol. 2018 May 9. [Medline]. I want to thank Simon Rhodes, PhD and Stephen Shalet, MD for kindly allowing me to republish illustrations from their work.